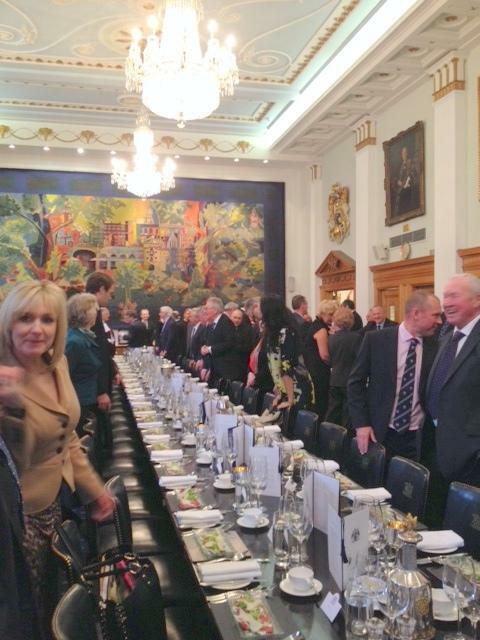 On the 6th February 2014 I attended the Court and Livery Luncheon of the Worshipful Company of Butchers at Butchers’ Hall, Bartholomew Close, London. I was welcomed to the 11.00 am Court Meeting to listen to the reports from their many and varied Committees, and to witness the admission of two new members to the ‘Livery and Clothe’. In addition to the Clerk to the Company, the Court consists of 21 members: the Master is assisted by a Deputy Master, five wardens and fourteen assistants. 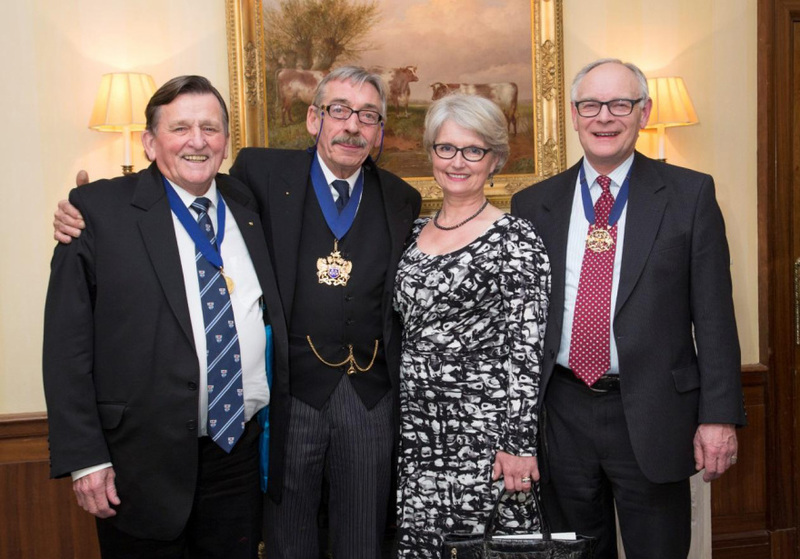 The Worshipful Company of Butchers is one of the seven oldest Livery Companies of the City of London. Earliest records indicate that in 975 in the Ward of Farringdon Without ‘there are divers slaughterhouses and a Butchers’ Hall where the craftsmen meet’. The Arms of the company were granted in 1540, and the Charter of Incorporation was granted by James I in 1605. In 1668 following the Great Fire of London, the Company moved from the Smithfield area to Pudding Lane, until the site was acquired by an Act of Parliament in 1884. So a new Hall was built in Bartholomew Close. The Hall was severely damaged during both World Wars, and the current Hall was rebuilt in 1960 with considerable refurbishment being done in 1996. Her Majesty Queen Elizabeth, The Queen Mother, was admitted as an Honorary Freeman in 1976 thus maintaining a bond with the Monarch started by King James I. Following her death in 2002, HRH The Princess Royal was admitted as an Honorary Freeman in 2003, and became Master in 2010. The Princess Royal also takes a keen interest in the Company and in fact attended the January 2014 Court Luncheon. Of course her visit to York in 2011 is well documented in a souvenir edition of Carnifex. The Court meeting was followed by a reception and luncheon for some 150 Members and Guests. It was pleasing to see several York Members who are London Members too, including our Clerk-Elect Jean Sawdon. Most notable of course was Ian Kelly, York Master in 2011, and who is currently the London Master. Ian is only the second person to become Master of both Gilds, the first being Brian Wheatley who was London Master in 2008, having been York Master in 1998. Brian was our host for the event and he did a wonderful job of looking after myself and Mary Rose. It was a great honour and pleasure for us to enjoy their company at this splendid event (see photo: Brian Wheatley, Ian Kelly, Mary Rose Selman and Jeremy Selman). The Luncheon was held in the magnificent Great Hall. The photo above shows the tapestry, a gift of Ronald Vestey in 1964, which was made in the famous Aubusson tapestry factories (in the Limousin region of France). The oldest church in London still standing, the 12th Century Priory Church of St Bartholomew the Great, is the adopted church of the Company (see also interesting Editorial article on some of its history in the Autumn 2013 Carnifex ). Butchers’ Hall and the Hospital of St Bartholomew have stood side by side for years and continue to forge links together, such as sourcing interesting guest speakers. 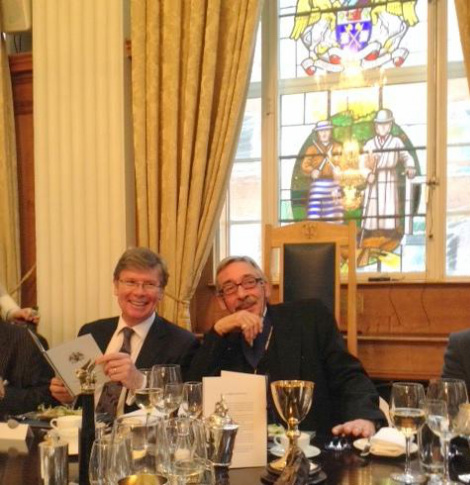 The guest speaker at this luncheon was Professor Nick Lemoine who is Director of the Barts Cancer Institute. In his speech he described an increasingly positive and hopeful outlook for those who suffer from various cancers, largely due to active programmes of research which are resulting in much greater understanding, and in new approaches to treatments (see photo: Prof. Lemoine on the left, with Ian Kelly; note also the stained glass window).